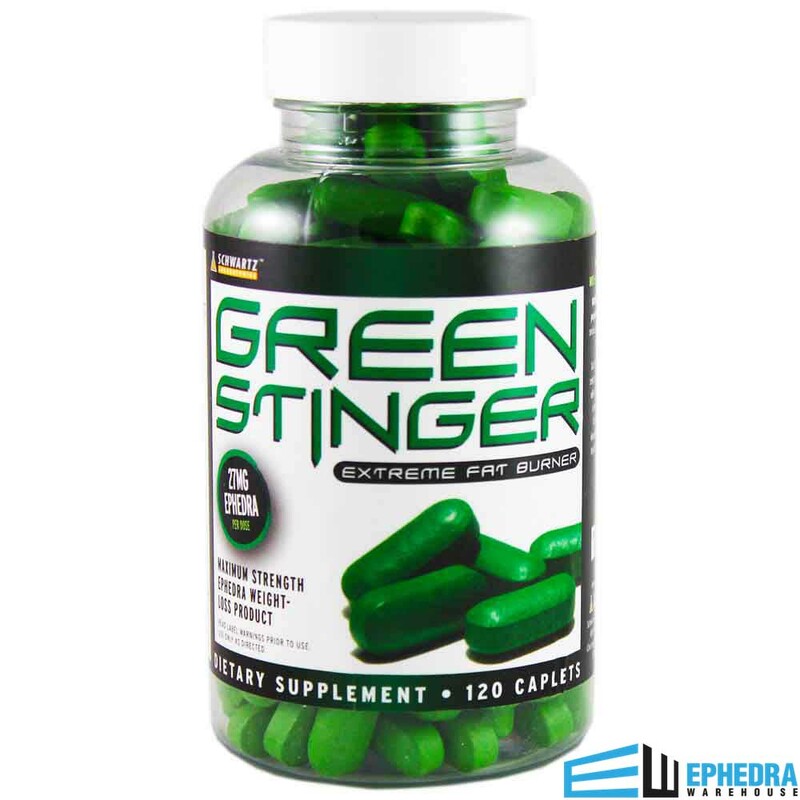 Green Stinger Ephedra: If you're looking for Green Stinger reviews check out the tab above. Green Stinger with Ephedra is a potent thermogenic weight loss supplement with ephedra. If you want to try to lose weight fast and create the body you desire, try Green Stinger today. Green Stinger is designed to boost your metabolism, increase your energy, and improve your body's ability to burn fat. Green Stinger reviews will give you some insight into how well this product works for users. 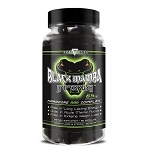 Many Green Stinger Reviews show 5 Stars because our customers love this top rated diet pill. Green Stinger Diet Pills with Ephedra 27mg, manufactured by Schwartz Labs, was developed as a weight loss supplement for those who don't want to mess around with ephedra-free products. When you try Green Stinger, you may reap the benefits of increased energy, improved mood, and suppressed appetite. To use Green Stinger, consume two caplets as required, anywhere from two up to three times in one day. We recommend staying hydrated while using Green Stinger to ensure the best results. As with any new medication, consult your doctor before consuming Green Stinger. For the best results and to avoid side effects, follow the directions for use carefully. Why did Schwartz Labs create Green Stinger? 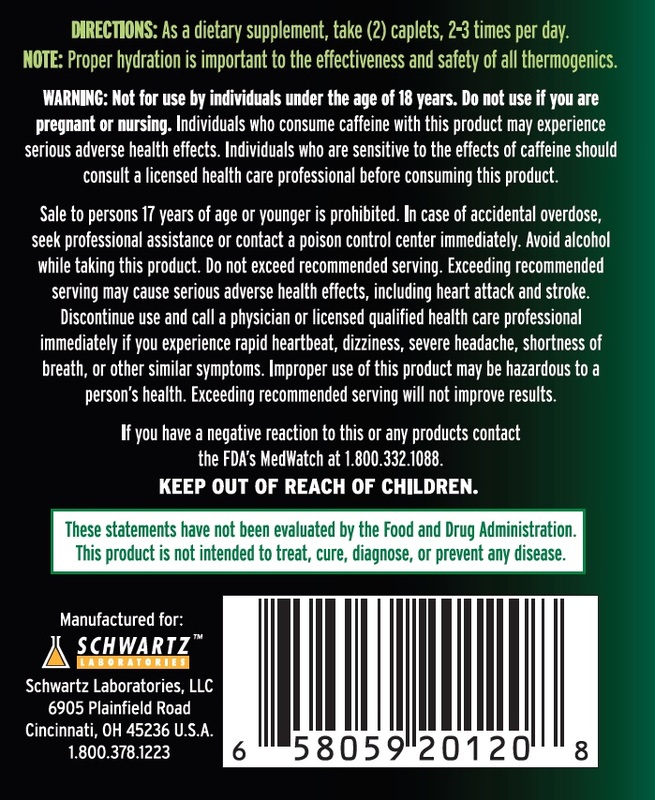 Green Stinger from Schwartz Labs was created with much consideration to what consumers want in an ephedra diet pill. They added Phenylethylamine HCL and Theobroma Cocoa, which together may counteract some of the jittery feelings stimulants can sometimes cause. This may give you a much more pleasant energy boost that can also improve your mood. Be sure to check out our Green Stinger reviews, and feel free to write your own Green Stinger review after you try this product! One of the best weight loss products I've ever tried. Started at 385 lbs, now 374 after one week. Definitely recommend but would start with half the dosage at first. I have been taking Green Stinger for 2 weeks and have lost over 20 pounds! It was getting difficult to lose weight because of my age (53) and going through menopause and this product has worked great. I was taking 2 capsules a day to start and just increased it to 3 a day. I love this product and will be ordering again. green stinger! Take one in the morning and it gives you energy all day long. Then take one before the gym in the evening. Give you plenty energy to get you through your workout. No shakes, no crash and most important decreases my appetite. Having been away from ephedra for the past 10 years I was really looking forward to trying this product! I received part of my order rather quickly, which I was very happy about and took one after opening the package and I was not disappointed! Being a speed freak, I've searched and tried many things since 2004 and the big ban event to compare to the supplements I was taking prior to 2004 and NOTHING HAS COME CLOSE, Until now! This product does surpress and curbs your appetite so you can cut down on your food intake at meals, as well as eliminates any snacking In between meals! For me, there are 2 negatives regarding this product, I can tell when it's starting to "wear off" and I start getting tired. And I didn't waste much time at one pill a day and quickly was taking 2, problem with 2 at the same time is that you need to take them with food, full stomach or while drinking a glass of chocolate milk, is hat I prefer! But thos things are overdone by the positive benefits I receive from taking this supplement each day! I highly recommend trying it, especially if you haven't found what you need, in the one you need! the thing I liked the most about these are that I can break them in half. that might not be a big deal to most of you, but it is to me! I cannot express my gratitude enough for this product. I have lost 78 lbs. kept it off for two years and counting. This product is amazing! I get all the energy I need for a great workout, and feel great! Just follow the directions on the bottle, and you will succeed in amazing results. My daughter uses it and already lost 38 lbs. in 3 months. Way to go Green Stinger! A good pick me up. In three weeks I have lost 12 pounds. With exercise and these, you will lose weight. It will curb your appetite and doesn't make you shakey. It seems as if this product works just as well as the pre-ban ephedra of the early 2000's. I only had jitters the very first day taking it, after that my body adjusted and haven't had them since. After 1 & 1/2 weeks I've lost 10lbs and have abundant energy, it also curbs hunger cravings and makes you feel full eating just a small portion. Bottom line: you will get results taking this, I would highly recommend Green Stinger to anyone thinking about it but to also research thoroughly and make sure it's the right product for you. 4 star rating for now but easily 5 if the current results continue after steady use. Green Stinger has been awesome. It provides a high level of energy for my workout each day and Since Christmas I have lost 30lbs. I am sticking with it! 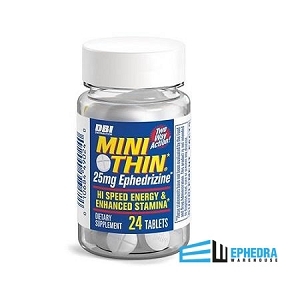 It takes 2 tablets to get the 27 mg of Ephedra that actually helps curb appetite. Directions suggest up to 6 tablets a day. What these pills are really good at is to make you sweat like a puddle. This is no doubt due to the other ingredients in these very large tablets.I was sweating so much it became embarrassing in public. I restricted intake to only 2 tablets a day, but with only 27mg of Ephedra, my appetite was not much diminished. Gave me terrible gas, energy level was good with this. Lost no weight, actually gained a few pounds. I love this product! Between kids and the gym, this puts that extra pep in my step to keep me going during the day. No jitters, and no crash. I have used other products and found that my body either gets used to them very quickly or nothing happens. I will deff be purchasing this again!!! As of now, I can only give this product an average rating. I have not noticed any significant difference in my energy during the day and during more workouts. No significant change in my weight has shown either. The one thing I can credit this supplement for is that it does not give the jitters or sleepless nights. That's a plus! I'll report back on this if any noticeable differences are made throughout the next couple of weeks. Great product!!! Shipped fast!!! Take 2 every morning and this gives me energy all day. My appetite is reduced too. 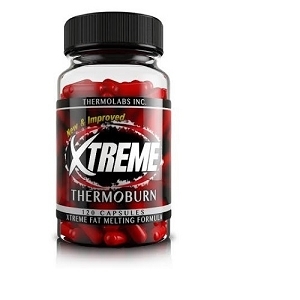 I don't feel jittery at all but do feel the thermogenics working to melt the pounds away. I really like Green Stinger. So far it totally controls my appetite and I have lost 5 pounds in 7 days.....amazing! I take one a day and I am amazed at the positive, useful energy I receive without feeling jittery. This is a well-crafted product that I would highly recommend. This product gets the job done. It got me shredded while curbing my appetite. No side effects, and no problem falling asleep at night. I take 3 tablets in the morning on my workout days (5 days a week) the energy on the treadmill is amazing, i can feel the fat melting off my body. Doing cardio without it now would be pointless and a waste of time. I've been trying Green Stinger now for almost 2 weeks. I've already lost 7 pounds. I had to take one capsule 3 time a day instead of 2 It was a little to strong but 1 is great. Gives me energy and helps with my appetite. Will definitely be buying again. And definitely take with food it helps. Great product, does not give you shakes, gives an energized feeling about 45 min after taking. Can take twice a day without leading to sleep issues. Great Product! This is the Real Deal! You Won't Be Disappointed! Love it, took this and hell fire NOT at same time... but I lost inches not weight tho... felt similar to a water pill but energy was great and my clothing size has dropped want to repurchase but not at 79.00.. eek! Decent, But not as good as Lipodrene original. You do get a kick from Green stinger but it "feels" different. The pick me up isn't as clean and crisp as Lipodrene original. These will get you through though. Have been taking for about a week now and so far have lost 4 pounds. I take two in morning and two in afternoon and it helps me to not snack on junk food also makes me fuller faster. Would recommend for people to try. Pro's, extra energy, suppression of appetite were what I liked best about it. Con's, occasional headaches and only 13mgs of Ephedra per pill were the 2 drawbacks. Overall, a good product! I have been taking the green stinger for about a month now and it had proven to me that I have less cravings and more energy. I like that its not loaded woth caffiene because I dont like the jitters. Love these. don't need coffee anymore and no jitters. Perfect amount of energy I take 4 per day, 2 with each of my smoothies. Great product for the price! I take one pill three times a day and it keeps me going. Awesome product....I'll be buying more. Just the boost I needed!!! The best product i have tried. I don't drink coffee or caffeine in morning so I take 1/2 tablet in morning and other half in afternoon. gives me energy without jittery feeling. The product works great! It curves my cravings and I don't get the jitters with it like others. I've been on for almost two weeks and have lost 3lbs so far. Love it!! Green Stinger does what it says it will do. I've been using Green Stinger for about three years now. 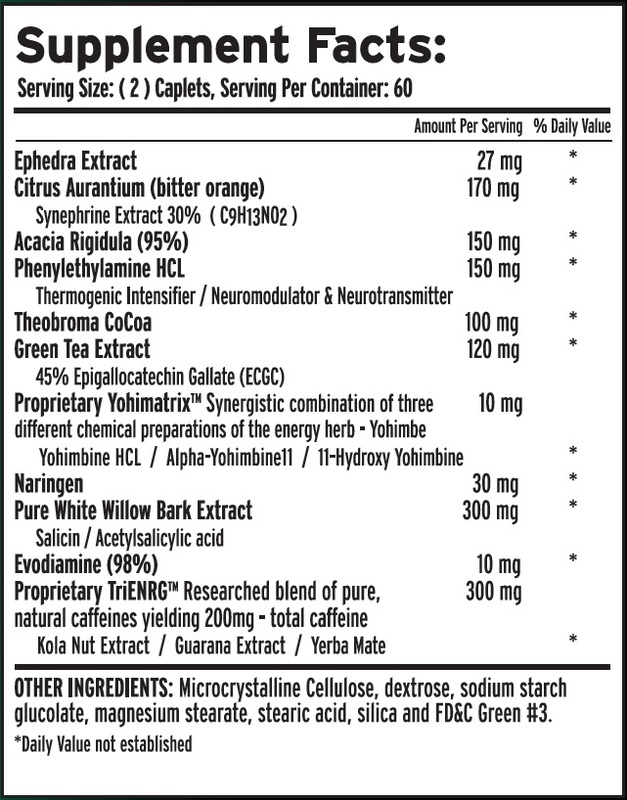 I have tried many other energy supplements since the real ephedra sinica deals were outlawed. I only take a quarter of one caplet , two to three times a day, and it definitely gets me energized for work or hiking. Green stinger seems to do what it claims it will do. I weigh 160lbs. so I would not take more than one whole caplet under any circumstances. Gives me great energy without the jitters. With lower doses, easier to spread out throughout the day and not crash so hard. Started two weeks ago, haven't lost any weight but it does curve my appetite and I get tons of energy! I also take less then the recommended dose. I take these before I work out. They give energy without the jitters that some give. Def. need to take two on an empty stomach before having any effect. Worked well as stated in other reviews. Just started taking Green Stinger , hope to have great results! I am not new to diet/energy pills but I am new to ephedra based products. I had actually received this as a sample along with my purchase of black Mumba hyper rush. Nervous about the hyper rush, I decided to try this one first. It did give me a boost of energy but nothing like I get from hyper rush.